That is so clever and easy! Who knew?? Thank you for this! This is FABULOUS! I know someone who was looking for something exactly like this, thanks tons! I'll be linking. Very Cute! I am going to use some of daddy's old ties that have tiny stains on the big part! Thank You!!! Im going to make one today! Very clever, too cute. Your son is adorable. I love, love, love this! 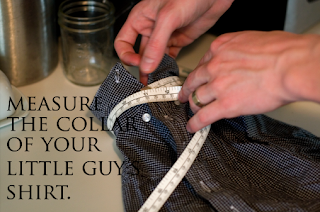 It will be great for my little guy and an awesome way to save stained ties. It waould also be an awesome baby shower gift!! All of us here in the art room think that we have our baby boy showers taken care of for the rest of the year with this idea! This is so cute! That's 2 Christmas presents off the list! Thanks for posting, and your baby is absolutely darling! That is a super cute idea. I can't wait to make one for my son. Great idea and tutorial. 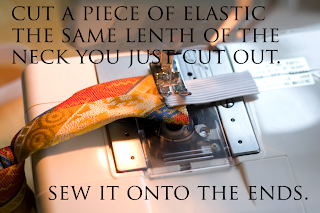 Oh I can't wait to hit a thrift store and pick up some old ties and make these as gifts. HOw fun. absolutely genius! 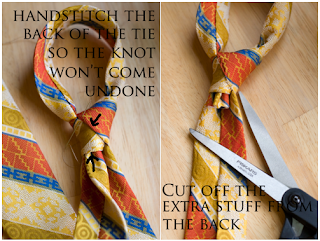 I have been looking for a way to make a cute tie for my baby and this is definately the way I will do it! 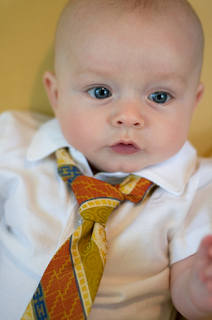 I am going to buy two ties, one for my baby and one for my husband, that match for father's day at church! Heather, you are one brilliant mommy. Bless you! I've been needing to make a tie for my two-year-old because I know he won't keep a clip-on on and he really wants a tie like daddy but everything I've come up with was WAY harder than this! Wow! Thank you so much!!! I have been wanting a tie for my little boy but couldn't find any tutorials anywhere. This is awesome! Thank you!!!! fantastic! i love it. thanks! I love this! I was given a whole bunch of old ties right before I saw this, so it was perfect timing. I made some of my own with a couple changes...I used buttonhole elastic and a button, so it can grow with the baby and also managed to get a toddler tie out of what was left. If you'd like to see it, I've got it posted on my blog here http://helpinglittlehands.blogspot.com/ . And of course there's a link back to your blog at the beginning of the post since you had the original idea. Thanks so much!! OH man this is so easy and cute! I'll have to find an old tie in my husbands closet!! this is great. i just made one for my son's first birthday! I'm featuring this on my blog! Thanks for the great idea. Thanks so much for the tute!! Wow! 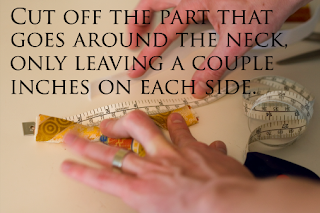 I never thought that is going to be so easy to make a baby tie. I was always looking for baby tie but it is giving a hard time. Now that I know how to do it. It is going to be so easy. Genius! 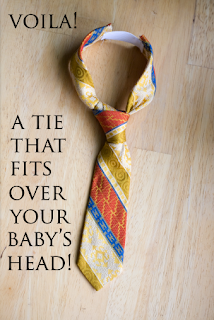 You have no idea how long I have searched for a baby necktie in stores. Problem solved! can't wait to make some of these for our *new* addition. . . after having two girls it's nice to see that their is cute projects for baby boys too! I love these! I actually put velcro on each side so it was adjustable. Thanks for the awesome tutorial!! 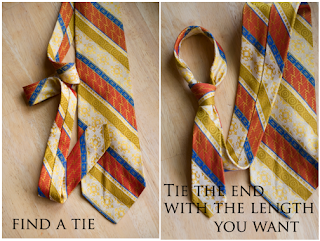 I've seen quite a few upcycled men's tie to boy's tie tutorials. This is by far, the quickest and easiest one I've found yet!